How to serve static files from another folder other than wwwroot folder in ASP.NET Core application? 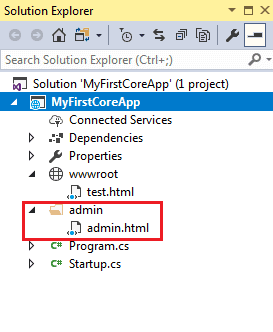 How to serve static files from different folder than wwwroot folder in ASP.NET Core App? You can configure middleware to serve static files from other folders along with default web root folder wwwroot. For example, we will server admin.html from the following admin folder and also test.html from wwwroot folder. Now, configure the StaticFiles middleware in the Configure() method of Startup class as shown below. As you can see, app.UseStaticFiles() enables default web root folder wwwroot to serve the static files. The above code configures Content admin folder to serve static files on the request path /admin. So now, we will be able to execute HTTP request http://localhost:1234/admin/admin.html to display static admin.html page.